A New CoP has Sprung! The partnership between BRIDGE and the Gauteng Department of Education is growing in leaps and bounds. On the 5th of May, BRIDGE and the Gauteng District launched the second CoP in the district, bringing the total number of CoPs supported by BRIDGE to six. The cluster for this CoP consist of schools from the Etwatwa township. The geographic spread of the six CoPs is as follows: two in Gauteng East, one in Ekurhuleni North, one in Ekurhuleni South, one in Sedibeng East and one in Sedibeng West. 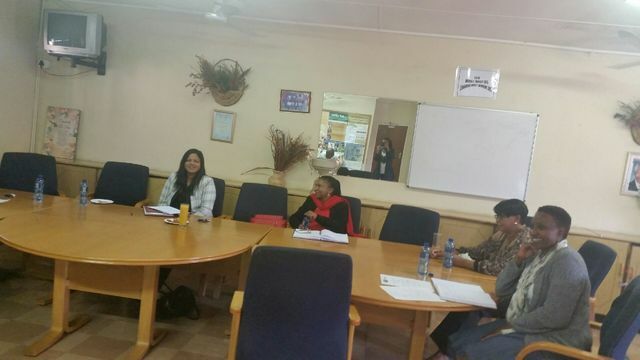 The launch was attended by GDE officials, principals and BRIDGE support staff. Dr Razia Ghanshi Badasie, the principal of Brenthurst primary school and one of the founding members of the first Gauteng East CoP, gave motivational input and reflected on the benefits of participating in the Gauteng East 1 CoP which include; emotional support, working as a collective to achieve curriculum targets in mathematics, motivation, leadership and management support and networking opportunities. The CoP and association with BRIDGE has also enabled her to share working practice with regards to Professional Learning Communities (PLCs). The principal has established a number of PLCs at Brenthurst primary school to enhance teacher professional development. Discussions with Gauteng Department of Education are underway to establish 4 additional new CoPs in the districts.